Victoria (Seychelles) – April 13, 2017 (travelindex.com) – During the auspicious occasion of the International Advisory Board of World Islamic Economic Forum (WIEF IAP) meeting held Eden Bleu Hotel in Seychelles on April 12, 2017 which is co-hosted by the FORSEAA (Forum of Small Medium Economic AFRICA ASEAN), Mr. Nico Barito Secretary General FORSEAA has invited Mr. Alain St.Ange, former Minister of Tourism, Civil Aviation, Ports & Marine of Seychelles, who is a prime candidate for the upcoming UNWTO (United Nations World Tourism Organization) elections for Secretary General to voice his call to the friends from Islamic Business Group to look at the new modalities of ‘Halal Tourism’ as another niche product of tourism which will bridge the tourism between the Muslim and non-Muslim worlds towards peace and prosperity. Alain St.Ange companied by Sherin Francis, the CEO of the island’s Tourism Board said as he addressed the delegates present that Seychelles had successfully attained achievement of result to be the destination known simply as another world. Seychelles tourism focuses on niche group and has successfully contributed to the nation economy especially to its people. Our bid for the position of Secretary General of the UNWTO speaks of ‘Tourism for All’ and promotes the concept of tourism without any discrimination. The Seychelles former Minister spoke at length about the island’s Statement of Intent submitted to the UNWTO HQ in Madrid. He said niche tourism covers the Halal Tourism or simply Muslim Tourism as much as it covers those with disability, women, LGBT, religion, politics and all this immaterial of the colour of the skin, gender or sexual preference. For this Seychelles thanks the support of neighbouring Islamic countries that have helped realise adequate air connectivity to the world. “We want to share our experience in profiling our destination as a neutral and peace loving country for all tourists of the world, who deserve a holiday of a lifetime in another world” St.Ange said. During the dialog with World Islamic Economic Forum, both Mr. Barito and Mr.St Ange raised the issues that the world at large wakes up to everyday on TV Screens. “News is centred on acts of terrorism or radicalism that continues to make would be travellers feel uncomfortable and worry about travel. It is through tourism that we need to correct this vision. When tourism works, economies of so many countries works and the livelihood of millions are cared for. This will bridge the gap between different cultures and help create a climate of peace” Alain St.Ange said. “Tourism and Culture has proven to be instrument which open the border of any nations to the world. There is no limit for culture and tourism. We want to show case that the new era of Tourism for All brings an industry in all its diversity inclusive of ‘Halal Tourism’ or ‘Muslim Tourism’ and not talking merely about investor or a capitalism industry – but it is transition of capacity and best practice to the local communities, to prove their local wisdom, their culture to show case their commitments to promote religious tourism, culture and nature to the open world market of tourism. We want to foster peace and coherence, we want to see the flow of tourism traffic of non-Muslim and Muslim countries and reciprocally enhance the atmosphere of new economic era of tourism. We want to call the upon the world to raise our brothers from the devastated Muslim countries to build their culture and tourism and open their countries as Halal or Muslim Tourism destination. Despite the fact that Halal tourism is now a new trend of niche tourism, we want to look further that the Muslim Tourism should be a new mechanism to foster sovereignty and build dynamic opportunity for the youth and woman entrepreneurship in tourism. For this we call upon the support of all members of WIEF to spread the message from the Small Islands State in the Indian Ocean” said Alain St.Ange and he is firmed to prioritise the Muslim Tourism agenda when he takes the office of SG of UNWTO . Former Seychelles Minister St.Ange also spoke about the decentralising of the UNWTO Madrid Head Office with the opening of Satellite Offices in key Member States by Region and the desire to have one tourism industry and not two and for this to bring into the UNWTO all the countries who are today not Member States of the UNWTO. He also touched other important points in the Seychelles bid before asking delegates present to go back to their respect countries and to appeal to their Governments to Vote for Seychelles on the 12 May. The Seychelles former Minister said that the SG of the UNWTO should be beyond politics and the Diplomatic bargaining of Vote for a country and a reciprocal Vote will be given in a future election was a but disservice to the tourism industry because this industry was one that will impact the livelihood of millions if the right person was not elected. “Seychelles breathes tourism, we live tourism, we smell tourism and we depend on tourism. Vote for Seychelles on 12 May and not for those with the biggest budget or those with political muscle only. The vote is by secret ballot and vote with your conscience” St.Ange of the Seychelles said. The World Islamic Economic Forum, whose patron founder is Prime Minister of Malaysia started off from a modest beginning as the OIC Business Forum, which was held on 15th October 2003, in conjunction with the tenth OIC Summit in Putrajaya, Malaysia. The inaugural OIC Business Forum sought to create a business ‘face’ of the OIC. 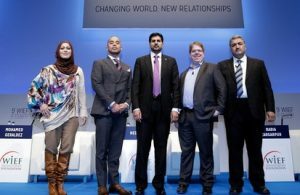 The Forum brought together government leaders, captains of industries, academic scholars, regional experts, professionals and corporate managers to discuss opportunities for business partnerships in the Muslim world and bridges to the Non-Muslim world. Former Minister St.Ange presented the Chairperson of the World Islamic Economic Forum Seychelles meeting with one of the island’s endemic Coco de Mer nut and Sherin Francis on her part presented to the Chairperson a book on the Seychelles.